In the Exodus narrative, the word for Egypt, Mitzraim, can be translated as a “narrow strait.” As we prepare for Passover, let us explore ways in which the Exodus story is relevant in our lives today and what it means to feel constricted and limited by our “narrow places.” What mindsets keep us stuck in Egypt? How do we deal with uncertainty, disappointment, frustration? What replenishes our wells of life, joy, and connection? 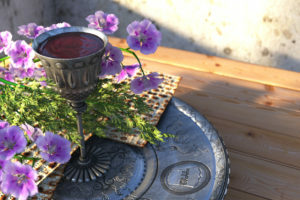 Through Jewish text, poetry and meditation we will explore how the living waters, mayim hayim, can help us reach out of the “narrow places” toward hope and healing.